“Once there was a postman who fell in love with a Raven. When the postman found a letter in his sack with an address on that he didn’t recognise, he thought it must be a mistake. Believing he was already destined to a lonely life, he didn’t realise the letter would lead to finding his one true love. A raven fallen from her nest needed protecting, nurturing and he was the one to do it. The unlikely couple grow closer and one day conceive a child, a human girl with a raven call. But the world isn’t ready for that sort of girl and soon she will witness that first hand. This tale tells of what will become of the young Raven Girl when she ventures out into the world without her parents, and it’s dark to say the least. I was warned that this book would be a bit strange. My sister an avid fan of Audrey Niffenegger warned that her stories are often mysterious, dark and complex and after finishing Raven Girl I now know what she meant. The story is like a fairly tale but one I have never experienced before. It is dark and strange but has undertones of modern day science. A lot of people may feel uncomfortable with the juxtaposition of this as there are some things so well explained and others that aren’t but to be honest I loved the feel of it and even with the modern science information I thought there were undertones of the myth and mystery of the fairy tales we know and love. The characters are interesting but not that well developed. This is probably more to do with the limits involved when writing a story with so few words though. At 77 pages long this book is more a short story with beautiful full page pictures. It’s not a graphic novel in the form I am used to but more like a child’s picture book… However I would be very reluctant to give it to a child to read. It borders the boundary between young adult, new adult and adult and to be honest I would say its for anyone above 14 who likes deep stories. The writing is beautiful and did remind me of a fairly tale in the traditional sense. I expected some off the things that happened to happen but still enjoyed reading them as they unfolded. The pictures were odd and not exactly what I was expecting but I grew to love them by the end of the book and my favourite, without spoiling things, has to be the detective boy ins right towards the end. 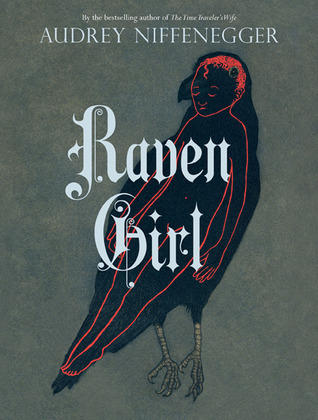 Raven Girl is a strange story and probably not the best introduction to Audrey Niffenegger for a new reader like myself. Thankfully I have her critically acclaimed novel The Time Travellers Wife to read soon and I think that will sit a bit more comfortably with me. Raven Girl was published in May 2013 by Jonathan Cape books. My copy was purchased at the Manchester Literature Festival event with the Author.